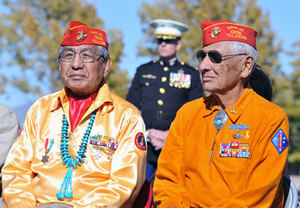 The Heroes Project honors individuals who have dedicated their time, talent, and energy to help Native American elders. They help solve local problems, share cultural traditions, and build stronger communities. These are your neighbors whose efforts often go unrecognized. Help us say “thank you” to these Heroes who help build stronger communities by supporting and nurturing their elders. Any individual in your community or across the continental U.S., Alaska, or Hawaii is eligible to be nominated. Please help us recognize individuals who have impacted the lives of Native elders in your communities or nationally.